Perhaps Standard & Poor’s and fellow rating agencies share keen interest because Turkey and Turkish corporations and financial institutions have over recent year been assertive borrowers in international markets. For the past decade, President Erdogan has championed Turkish economic renaissance, a powerful boom that has been fundamental to his popularity and ascending political power. Unfortunately, it morphed into a Credit-fueled Bubble, with all the associated financial, economic and social consequences. Turkish consumer debt has skyrocketed, fueled by aggressive bank lending. Meanwhile, Turkey’s financial institutions have borrowed aggressively in global inter-bank markets, with much of this debt short-term and denominated in foreign currencies. The Turkish Credit Bubble gained important momentum as part of the post-2008 global EM funding boom. Estimates have as much as $300 billion having flowed into Turkey over recent years, inflows that accelerated with the 2013 sovereign rating upgrade to investment grade. As a NATO member, aspiring EU nation and key ally in the explosive Middle East, Turkey benefited greatly from the view that Europe, the U.S. and the world, more generally, would not tolerate crisis engulfing Turkey. Erdogan and his AKP party have been huge beneficiaries of the global funding boom, both financially and politically. Now, with the tide having turned, previous bedfellows - the rating agencies and global finance - will be pilloried and villainized for political advantage. To be sure, they’re a precarious mix of C’s – coups, crackdowns, crackpots, Credit and confidence. It’s worth noting that the domestic purge has expanded past university deans to school teachers to to bank regulators. Turkish stocks dropped 13.4% this week, the “worst week since 2008.” Turkish bank stocks were down 5% on Thursday’s debt downgrade, as sovereign yields surged 26 bps (from Bloomberg). For the week, Turkish sovereign CDS jumped 66 bps to 336 bps (from Reuters). Turkey’s lira declined 1.7% to another record low. In any other environment, Turkey would be facing a crisis of confidence along with a major test for its currency and banking system. The unfolding EM debacle is one of the saddest consequences arising from the U.S. mortgage finance Bubble - turned reflationary QE before transforming into the global government finance Bubble. Throws Trillions of loose finance at the emerging markets and rest assured there will be epic corruption, economic maladjustment and destabilizing social and geopolitical stress. As for corruption and malfeasance, China, Brazil, Russia, Turkey and Malaysia come quickly to mind. Yet it’s systemic, the upshot of what has become a hopelessly dysfunctional global system. Indeed, EM these days has regressed into one big highly synchronized and vacillating Bubble. That EM could now somehow be experiencing record inflows in the face of such financial, economic and social instability is remarkable. There is precedent. Apparently unappreciated by contemporary central bankers, over-liquefied and speculative markets are by their nature mystifying. They will confound – and seem to revel in doing the exact opposite of what is expected. Bubble markets will undoubtedly behave in a manner that guarantee that the most damage is inflicted upon the largest number of participants. I was in awe as “money” flooded into GSE debt and MBS following the subprime eruption in 2007. The Bubble had been pierced, with Trillions of securities and assets mispriced throughout the markets. Yet speculative impulses and confidence that aggressive monetary stimulus was in the offing ensured prices became only further detached from reality. MBS yields sank 100 bps in the six months preceding early-2008, extending “Terminal Phase” excesses and ensuring risk markets turned highly correlated – and acutely vulnerable. A powerful short squeeze throughout EM has at this point morphed into self-reinforcing inflows. Recent outperformance has incited the mammoth – and fidgety - trend-following and performance-chasing Crowd. 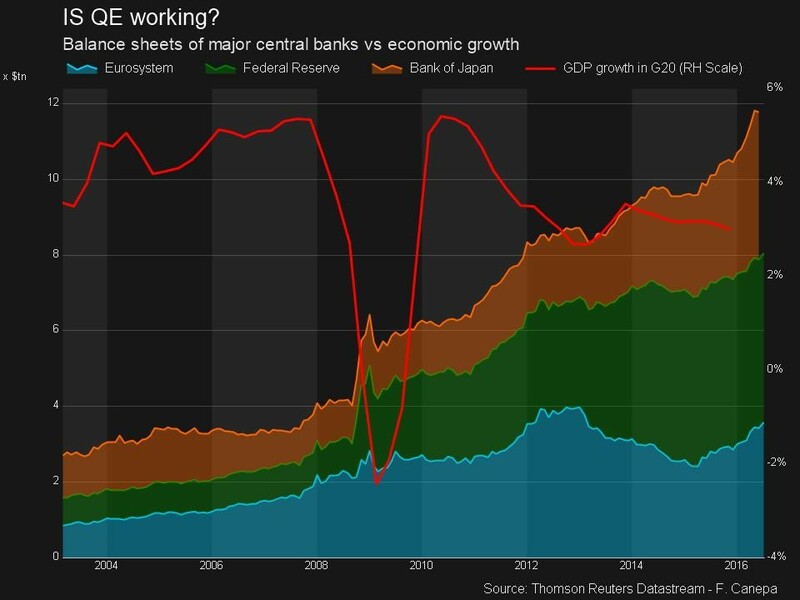 Of course, global QE and zero rates have been instrumental. Moreover, the policy-induced market dislocation that has created $12 Trillion of negative-yielding sovereign debt has unleashed another powerful round of global yield-chasing flows – right in the face of fundamental deterioration. Importantly, EM outperformance has worked to further synchronize global markets into one big highly-correlated speculative melee, a Bubble resting precariously on the simple faith that central banks have it all under control. Chairman Greenspan used to posit (rationalize) that since real estate markets were a local phenomenon a national real estate Bubble was implausible. I countered that the Bubble was in mortgage finance and that a centralized mortgage finance Bubble was exerting a powerful nationwide inflationary dynamic. “Terminal Phase” excess proved so powerful that a tidal wave of inflationary finance essentially lifted all boats. These days, a similar dynamic has taken hold on a global basis, across asset classes. It’s a backdrop that continues to wreak havoc upon active fund managers – those more likely to incorporate micro and macro analysis along with risk control. It’s an atypical backdrop that continues to reward passive “management,” unencumbered by analysis and risk management. And as “money” floods in to play high-dividend payers, high-yield, low-beta, “defensive”, “smart-beta,” and EM, an inflating market forces short-covering, the unwinding of hedges and capitulation “gotta jump aboard ‘cause I can’t afford to miss the rally” flows. It boils down to one singular speculative bet on “the market.” All-time highs into an alarming, faltering fundamental backdrop? It happened in late-2007. What others label “bull market” I see as market dislocation. 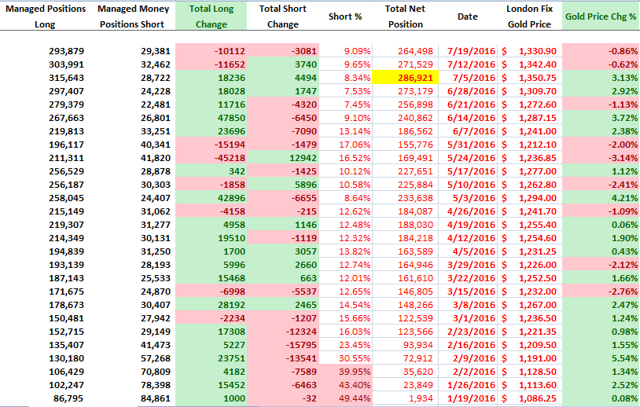 - Gold speculators continued to reduce both their net long and short positions for a second straight week. 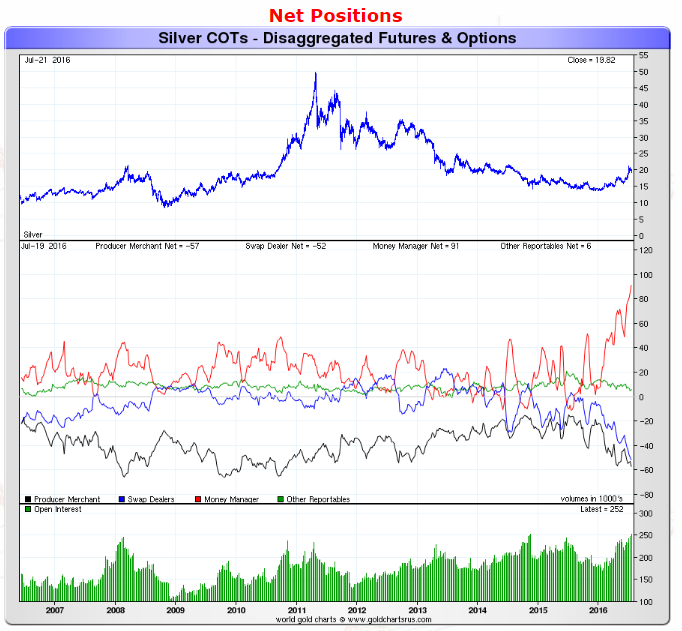 - While gold speculators were cutting back on positions, silver longs took their own positions to new historic highs. 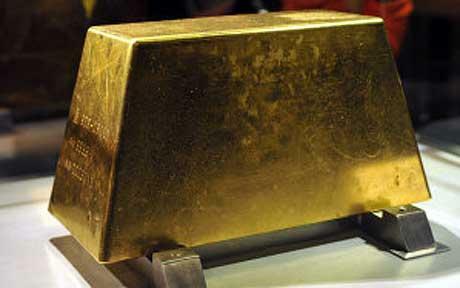 - We don't think silver has the strength to rise while gold declines so silver investors should be careful here. While we are interested in re-establishing some of our sold gold positions, we think investors should continue to be patient and wait for a further pullback. 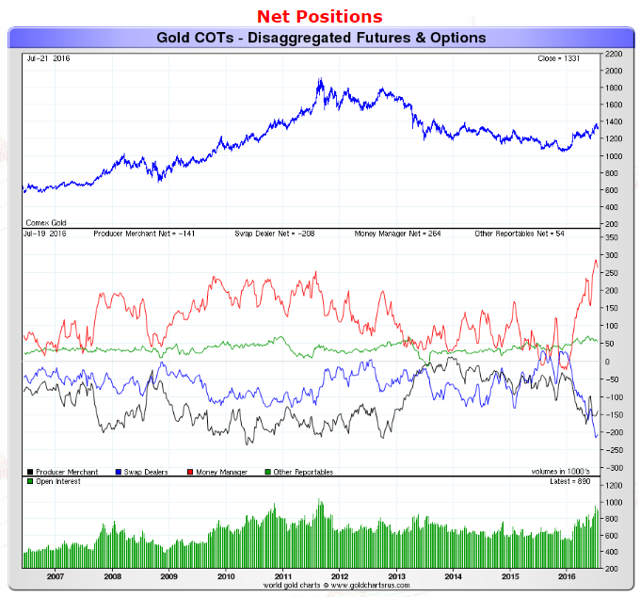 The latest COT report showed that gold speculative longs continued to sell their positions, which was in contrast to silver shorts that actually increased their long positions for the week. This is a bit strange as silver usually tracks gold and the speculative positions usually do the same. We will get a little more into some of these details, but before that let us give investors a quick overview into the COT report for those who are not familiar with it. There are many different ways to read the COT report, and there are many analysts that focus specifically on this report (we are not one of them) so we won't claim to be the experts on it. This week's report showed speculative gold longs decreased their positions for the second week in a row, while shorts also decreased their positions. While speculative gold longs decreased their positions again, the current outstanding long position of a little under 294,000 contracts is still the fourth highest on record - thus, there is certainly room to pull back further. The red line represents the net speculative gold positions of money managers (the biggest category of speculative trader), and as investors can see, speculative traders have taken a break from their parabolic rise and sit at a net long position of 264,000 contracts. The red line, which represents the net speculative positions of money managers, increased by a little more than 6,000 contracts while shorts decreased by a mere 200 contracts. This is the second week that we have seen a divergence from gold as speculative silver positions continue to increase while gold speculators have reduced from record-high levels. We are not sure why this is occurring, but we are not sure it is really sustainable unless we see significant industrial silver uptake - and we simply don't envision that with the weak global economy. While the focus last weekend was on the Turkish coup, and while that may have significant geopolitical consequences moving forward, currently it had only a minor impact on the gold market during the week. For the second week in a row, we saw gold speculators pulling back as they reduced both long and short positions from historic levels. In our view, this is good as we would rather be investing in gold when market conditions are a bit more balanced rather than going long while positions are already at historically long levels. Interestingly enough, while gold speculators were pulling back, silver speculators were once again increasing their own positions despite the weakness seen in gold during the week - for us this is a bit of a warning sign as we do not think silver currently has the industrial strength to hold its own if the gold price continues to weaken. We are getting a bit closer to levels where we would want to reinitiate some of the gold positions we have sold - but not quite yet. Thus, we think investors should hold off or lighten up on gold positions in the ETFs and miners such as the SPDR Gold Trust ETF (NYSEARCA:GLD), the ETFS Physical Swiss Gold Trust ETF (NYSEARCA:SGOL), and miners such as Randgold (GOLD) and Barrick Gold (NYSE:ABX). Currently, we do not see justification for the divergence between gold and silver and thus we think it is not a good time to be invested in the silver miners or ETFs such as the iShares Silver Trust (NYSEARCA:SLV). We are still at extremely high levels of speculative gold longs and historic levels for silver longs, so precious metals bulls should be patient here and wait for a bit more of a correction. Stocks have been helped by “wall of worry” and decent economic data, writes a Schwab strategist. Happy summer? From its Brexit-related low on June 27, U.S. stocks have staged an impressive 8.5% rally. One of the best setups may have come courtesy of investor sentiment. In Schwab’s midyear outlook, published earlier this month, I noted the extreme dearth of bullishness at the end of the second quarter via the American Association of Individual Investors (AAII) survey. Coupled with the high reading of the “neutral” camp, we were seeing the lowest level of bullishness and highest level of uncertainty since the aftermath of the Crash of ’87. Remember, sentiment tends to work as a contrarian indicator at extremes. The cautious stance (and likely portfolio positioning) meant there was fuel for the market with even a small catalyst—in this case, notably better economic data. As you can see in the chart below, bullishness has increased alongside the rally, but remains fairly subdued. As I’ve pointed out many times over the past couple of years, although we believe the market will be subject to significant bouts of volatility and perhaps a greater frequency of pullbacks, it’s likely in the context of an ongoing secular bull market. Source: American Association of Individual Investors (AAII), FactSet, as of July 15, 2016. Case in point would be the improvement in economic surprises, seen in the chart below. After an 18-month stretch with the Citigroup Economic Surprise Index (CESI) unable to break into positive territory, the latest string of data releases launched it firmly north of zero. Remember, the CESI measures whether economic data are coming in better or worse than expectations—it does not measure the absolute level of growth. Many of the above economic indicators—including jobless claims and the ISM readings—are leading indicators. The stock market is a leading economic indicator as well. To see them collectively moving higher is not surprising. There are implications for Federal Reserve policy: In the immediate aftermath of Brexit, the fed funds futures market was forecasting a 15% chance of a rate hike by year-end; while as of Friday, it was up to nearly 45%. Outside of the stock market, U.S. Treasury yields rose (meaning bond prices fell), while other safe-haven asset classes sold off as well, including utilities and gold. At the same time, more cyclical areas of the market have performed well. With classic timing, just as the “STUB” acronym (staples, telecom, utilities and bonds) became a hugely popular investing “strategy,” those same areas came under pressure last week—both staples and utilities were down on the week. Since the June 27 low, the top-three performing sectors are all cyclical: industrials, financials and materials. Technically, the market’s rally to new highs has been impressive, albeit not perfect. The three-week decline in the volatility index (VIX) has been the largest on record. The 10-day advance/decline is at its highest level since late-2011. However, individual new high data have not expanded as emphatically according to Strategas. And seasonality could spoil the bulls’ party as July strength has historically often led to a weaker August-September (especially in election years). Prior to the market’s breakout, the Standard & Poor’s 500 had gone 413 days without a new one-year high. According to Ned Davis Research, that was the 19th longest stretch in the S&P 500’s history. The three longest stretches were each over 1,200 days (ending in November 1942, May 1933 and September 2003). The median returns looking forward after the prior 18 longest stretches were well above normal (especially one year later), as you can see below. We continue to recommend investors remain at their long-term strategic weighting to U.S. stocks, using volatility to rebalance around those normal weights. LONDON – The horrendous attack by a French-Tunisian man on a crowd in Nice celebrating Bastille Day, which killed 84 and injured hundreds more, will give National Front leader Marine Le Pen a massive boost in next spring’s presidential election. It doesn’t matter whether the murderer, Mohamed Lahouaiej Bouhlel, had any links to radical Islamism. Throughout the Western world, a toxic mix of physical, economic, and cultural insecurity has been fueling anti-immigration sentiment and politics precisely at the moment when the disintegration of post-colonial states across the Islamic crescent is producing a refugee problem on a scale not seen since World War II. In the last 30 years or so, a key benchmark for liberal-democratic societies has been their openness to newcomers. Only bigots could not see that immigration benefits both hosts and migrants; so the task of political leadership was to keep such views out of the dominant discourse, and to facilitate integration or assimilation. Unfortunately, most Western elites failed to appreciate the conditions of success. Although the movement of peoples has been a constant feature of human history, it has been relatively bloodless only when it was into scantily settled or developing territories. A classic case was the nineteenth-century emigrations from Europe to the New World. Between 1840 and 1914, 55 million people left Europe for the Americas – much larger, relative to population, than migration since WWII. Nearly all the movers were economic migrants, pushed out of their countries by famine and agricultural depression and pulled to the New World by the promise of free land and a better life. As the world industrialized and filled up with people, the flow of people from developed to developing areas reversed. Poverty and starvation still pushed migrants off the land in poor countries; now, however, the pull factor was not free land, but better jobs in developed countries. This set up today’s tension. After WWII, Western governments devised policies that aimed to balance the economic benefits of immigration (cheap labor) with protection of domestic jobs and ways of life. For example, between 1955 and 1973, West Germany admitted 14 million “guest workers,” largely from Turkey. But, though the guests were expected to return home after two years, these controls gradually weakened as part of the general movement toward free trade and free capital movements. Alongside economic motives for migration there has always been another: ethnic, religious, and political persecution. Examples include the expulsion of Jews from Spain in 1492, of Huguenots from France in 1685, of Germans and others from Eastern Europe following WWII, of some Palestinians from Israel in 1948, and of Indians from Uganda in the 1970s. In recent years, refugees have mainly been fleeing either persecution or extreme insecurity following state disintegration. We saw this in the Balkans in the 1990s, and in Afghanistan and the Horn of Africa in the 2000s. The five million Syrians now in Turkey, Lebanon, and Jordan are the latest and most dramatic example of this pattern. For this class of migrant, push factors are by far the most important. But the line between refugees and economic migrants blurs over time. History indicates that most refugees do not return to their country of origin. It takes too long for the feeling of extreme insecurity to subside; and, meanwhile, the lure of a better life takes hold. This explains an important fact about popular perception: most people in the host countries do not distinguish between economic migrants and refugees. Both are typically viewed as claimants on existing resources, not as creators of new resources. The flight of East Asians from Kenya during that country’s “Africanization” campaign led directly to the UK’s anti-immigration legislation of 1968. This historical perspective suggests three conclusions. First, anti-immigrant sentiment is not based only on prejudice, ignorance, or political opportunism. Anti-immigrant language is not just socially constructed. Words are not mirrors of things “out there,” but they have some relation to such things. You cannot manipulate something unless there is something to manipulate. We have little chance of changing the words unless we alter the realities to which they refer. Second, the era of unregulated mass population movement is drawing to a close. As the Brexit vote shows, Europe’s political class greatly underestimated the strains caused by free mobility across borders – a shibboleth of the failed neoliberal project of maximizing market-based resource allocation. Critics of neoliberalism cannot consistently exempt population movements from regulation. Indeed, the fatal flaw of free mobility in the EU is that it always presupposed a state to manage the movement. This state does not exist. Giving people an EU passport doesn’t legitimize a single labor market, which is why “emergency brakes” on migration within the EU are inevitable. Third, we need to accept the fact that most of the refugees arriving in the EU will not return home. The way forward is difficult. The easiest steps are those that increase voters’ security, in the widest sense, because such policies are within the control of political leaders. These measures will include not just a cap on the number of economic migrants, but also policies leading to expectation of full employment and continuity of income. Only if voters’ economic insecurity is diminished is there any hope for active policies to assimilate or integrate refugees, whose numbers Western leaders cannot directly control. The unsolved problem is how to reduce those factors pushing people out of their own countries. We may hope that economic development in Eastern Europe – or Mexico – will equalize conditions sufficiently to end net flows from one region to another; but ending the flow of refugees from the Middle East and Africa is altogether more daunting. Restoration of order and creation of legitimate authority are preconditions of economic development, and we don’t know how this is to be done. In some cases, it may require redrawing borders. But it is hard to see that happening without years of fighting, or to know how the West can reduce the bloodshed. One thing seems certain to me: without increased security at both ends, political violence will spill over from the Islamic world to its nearest neighbors in Europe. 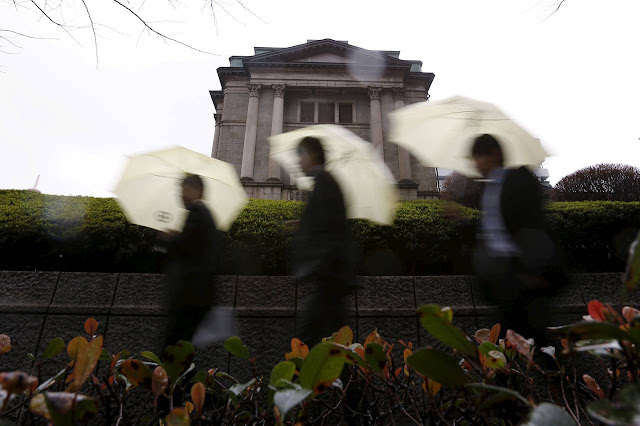 The world’s central banks have a wealth of concerns to address in the coming months. A new item on the list: their own actions, which are increasingly surprising markets, causing rather than easing volatility. With bond and stock valuations stretched, and policy perhaps becoming even more creative, that is a worrying development. There have been a string of misjudgments by markets lately. Take last week’s decision by the Bank of England to leave rates on hold at 0.5%. Investors had expected a quarter-point cut. When the BOE didn’t deliver, markets were volatile: the pound swung in a 3.7 cent range against the dollar over the day, according to FactSet, a big move. U.K. markets aren’t alone. 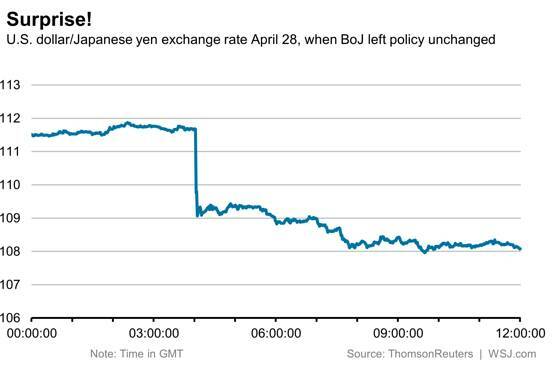 The Bank of Japan 8301 -2.70 % shocked investors by introducing negative rates in January, and then shocked them again by standing pat in April. The European Central Bank last December failed to deliver on admittedly sky-high expectations for an easing package, sending the euro up 2.9% against the dollar in its biggest one-day move in the last year. The U.S. Federal Reserve hasn’t delivered a real shock decision, but market expectations of action have moved sharply to and fro; investors have been unsettled by relatively rapid changes in tone, as well as the Fed’s shifting attitude to global risks. Assumptions that the Fed is on hold could yet be tested, especially after Friday’s strong consumer spending data. More vital decisions lie ahead for all four central banks, and the potential for gaps between market expectations and central bank reality appears high. Past misreadings carry a cost, as they may color investors’ interpretation of future actions. Policy options seem to be becoming extreme after a long period postcrisis in which they were more incremental: witness the debate about helicopter money in Japan. That long period had contributed to a consensus that central bank policies were acting to damp volatility in markets; but now shocks are on the increase. And the ties between markets and central banks have never been closer. The ECB, for instance, is now buying a dizzying array of fixed-income securities ranging from government bonds to corporate debt to asset-backed securities. Meanwhile, central bankers are sending out mixed messages. At the same time as pledging in various ways to do whatever it takes to prop up economies and protect financial stability—with the BOE’s Andrew Haldane calling for a “muscular” policy package to deal with the fallout from Brexit—many are also arguing more forcefully than ever that monetary policy isn’t the answer. They are right to do so, but markets don’t seem to be listening. Indeed, markets appear simultaneously addicted to never-ending stimulus and doubtful about its effectiveness and capacity to cause damaging consequences. The timing and trigger for a reassessment of this balance are unclear. But that looks like a contradiction that will need to be resolved, with potentially messy consequences for investors. ‘Bitcoin’ is on a tear away rally. Its’ performance, over the last year, has been outstanding and it has outperformed most ‘asset classes’, by a wide margin. It is probably the only asset class which beats out both gold and silver, in 2016. Why is it shooting into outer space? People look at alternate asset classes when their confidence in traditional assets fades. Since the beginning of the year, both the stock and the commodity markets have been on a roller coaster ride while catching both the bulls and the bears, on the wrong side. The macroeconomic situation of the world does not give confidence to the astute investors which is evident by the return of the legendary George Soros, who has come out of retirement to short the overblown markets. Similarly, other hedge fund managers are stocking up on gold, which supports our view that a ‘financial crisis’ is right around the corner. The “Brexit” results have also opened up a possibility of another round of easing by the central banks, around the world. The Bank of England will most likely resort to an easing schedule during the next meeting which will be followed by the European Central Bank and the FED. Post victory in the elections, the Japanese Prime Minister Shinzo Abe is likely to push the Bank of Japan to announce another round of ‘easing’. Since the last ‘financial crisis’, the combined central banks have pumped massive amounts of money into the system and they continue to do so, at a rapid pace, nonetheless, the world is closer to a ‘financial crisis’ than ever before. Compare this with the cryptocurrency ‘bitcoin’. Unlike the traditional currencies, the ‘Bitcoin’ has an upper limit of 21 million coins, post which no more Bitcoins can be mined. Every subsequent mining will become difficult and will reduce the reward associated with mining each block. Satoshi Nakamoto programmed that post-mining of 210,000 blocks, the rewards will be halved. Initially, the reward was 50 ‘Bitcoins’ for every block, which was halved by the end of 2012, at which time the reward was reduced to 25 ‘Bitcoins’ per block. The next round of halving took place, last week, when the rewards were reduced to 12.5 ‘Bitcoins’ per block. 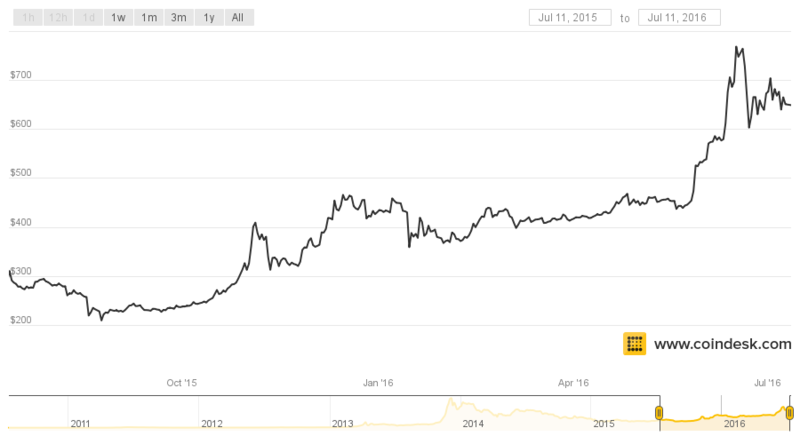 While the central banks have been on a printing spree, the ‘Bitcoin’ is on a tightening route which boosts its’ price, as is visible in its’ sharp rise, this year. A few miners will find it difficult to continue mining at the halved rewards which is likely to slow down new mining as halving will continue, in the future. “The block halving will dramatically decrease the bitcoin being added as we approach 75 percent of all bitcoin issued. People understand that in this world of ever expanding assets and printing of money, we have something that’s fixed and limited in issuance. It gives a decent alternative for people who want to hold assets that can have sustained purchasing power,” stated Bobby Lee, Chief Executive of BTCC which is one of the largest’ bitcoin’ exchanges, in the world, based in China reports CNBC. However, the ‘Bitcoins’ volatility has dropped dramatically over the past few years with the lowest linear level of volatility seen since is this asset class started. It has become easier to use for trading, purchasing and using for purchases. I am presently only highlighting that readers will do well to keep an eye on ‘Bitcoins’ and other crypto/digital currencies, along with gold and silver. In fact, I have been researching the digital wallet solution where I can purchase many up and coming digital currencies within one location as a NEW ASSET class for my portfolio. Why? Because I firmly believe the masses will slowly migrate their money into various digital currencies a safe haven store of wealth and for ease of use. Payments can be made with your mobile phone to anyone, anywhere in the world and for any amount with ZERO fees/costs, and in many cases it cannot be traced. So in short, I will share with you in future articles and as a subscriber to my trading and investing newsletter exactly which digital wallet, and digital currencies I will be buying and interested in learning more about as the world and financial systems evolve. When the time is right to invest my followers will know. The records provide a rough chronology of the scandal, which reaches back to the middle of the 2000s. Back then, European Commission experts noticed an odd phenomenon: Air quality in European cities was improving much more slowly than was to be expected in light of stricter emissions regulations. The Commission charged the Joint Research Centre (JRC) -- an organization that carries out studies on behalf of the Commission -- with measuring emissions in real-life conditions. To do so, JRC used a portable device known as the Freeway Performance Measurement System (PeMS), which measures the temperature and chemical makeup of emissions in addition to vehicle data such as speed and acceleration. This technology, which was later used to reveal VW emissions manipulation in the United States, was largely developed by the JRC. JRC launched their PeMS tests in 2007 and quickly discovered that nitrogen oxide emissions from diesel vehicles were much higher under road conditions than in the laboratory. The initial results were published in a journal in 2008 and they came to the attention of the Commission. On Oct. 8, 2010 -- roughly three years after the JRC tests -- an internal memo noted that it was "well known" that there was a discrepancy between diesel vehicle emissions during the type approval stage (when new vehicle models are approved for use on European roads) and real-world driving conditions. The document also makes the origin of this discrepancy clear: It is the product of "an extended use of certain abatement technologies in diesel vehicles." The reference is likely to the "defeat devices" -- essentially programs in the engine software -- that would shut off anti-pollution controls under certain conditions. According to an EU law passed in 2007, emissions control measures can only be switched off in specific situations -- to avoid engine damage, for example. VW, however, used such programs to produce low emissions when the software could detect a laboratory testing setting. EU member state governments were also apparently aware of possible emissions manipulation well before the VW scandal hit the headlines. In May 2012, a Commission official sent an email to relevant ministries in several EU countries, including the British, French and German environment ministries, describing a meeting of the Real Driving Emissions of Light-Duty Vehicles (RDE-LDV) working group. Led by the European Commission, the body includes representatives from EU member states, the Joint Research Centre, the automotive industry and NGOs. It focuses on emissions testing procedures. "Yesterday, we had a quite hot (in any sense) RDE-LVD (sic!) meeting," the email begins. Automobile manufacturers, it notes, "strongly resist" the introduction of PeMS testing during the type approval stage. One possible reason, the email notes, is the desire for "leaving the door open" to avoiding emissions test cycles. Shortly thereafter, the sensitive information made it all the way up to Antonio Tajani, who was European commissioner for industry and entrepreneurship at the time. In summer 2012, he was notified by the autoparts supplier Schrader Electronics -- both by letter and in a personal meeting -- about the software manipulations being undertaken by automobile manufacturers. The lack of action created friction within the Commission. While there are 28 commissioners -- one for each EU member state -- the commission is broken down into 33 departments, known as "directorates-general," each led by a director general. In November 2014, Karl Falkenberg, director general of the environment department, sent a letter to his counterpart Daniel Calleja Crespo, who led the Enterprise and Industry department and answered to Commissioner Tajani. The letter bluntly demanded that Crespo do his job, requesting that he check to see if "certain current practices documented extensively by the JRC" are consistent with the law. The practices mentioned in the letter include "emission abatement techniques that are switched off at low temperatures or when the vehicle needs additional power" -- exactly the kind of thing that got Volkswagen in trouble. Falkenberg notes in the letter that his department believed such practices were in violation of EU law. The European Commission continues to deny even today that it knew anything of the illegal practices. "We are just as shocked as everyone about the Volkswagen emissions manipulation," said a Commission spokeswoman. "No concrete evidence on the use of defeat devices or of the failure of a member state to act was ever brought to the attention of the Commission." In the documents, there are repeated references to the exertion of influence on the Commission, including by the automotive industry. But the VW scandal has pushed Brussels to act. Currently, a Commission proposal is under discussion that would require car companies to provide information about the software employed in their vehicles during the type approval stage to enable the external examination of that software. In mid-June, the European Commission agreed to adopt so-called WLTP (Worldwide Harmonized Light Vehicles Test Procedure) emissions testing, which is supposed to provide more accurate figures on the emissions and fuel consumption of new vehicles. For Claude Turmes, a member of European Parliament with the Green Party, the response comes much too late. "The Commission should have demanded that member states do something about emissions cheating many years ago," he says. Although the Commission had "concrete indications" about the practices in October 2010, "the political decision was made to do nothing so as to buy time." But while the Commission has displayed little in the way of contrition, a VW representative struck a different note on Wednesday in front of the European Parliament's Committee of Inquiry into Emission Measurements in the Automotive Sector. Ulrich Eichhorn, VW's head of development, said his company had made a huge mistake. "We are ashamed," he said.